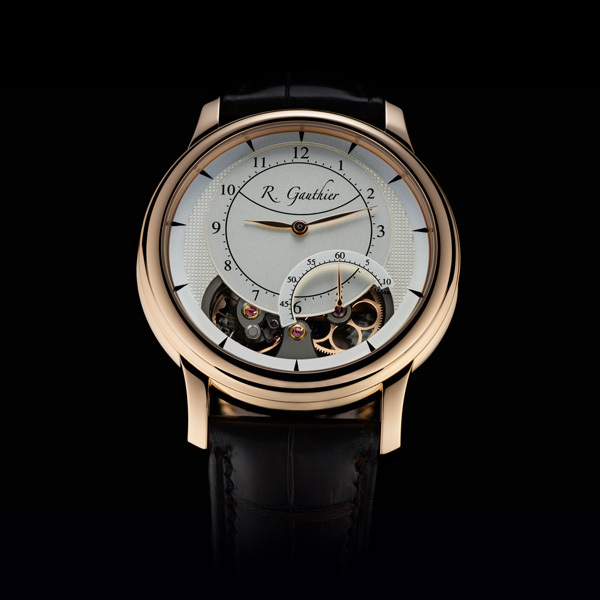 “With HMS Ten, supreme legibility was paramount,” says Romain Gauthier. “My idea was to have a dial with completely unobstructed views. Once the eye is drawn to the hour-minute subdial, it is then naturally attracted to the sectorial seconds. Nothing disturbs the wearer’s reading of the time. The graceful 41mm diameter case is distinguished by pure, clean, unbroken lines around its full perimeter. However, it is the absence of a normal crown that reveals just how remarkable the movement is. Placing the crown flat on the caseback increases winding efficiency because energy does not need to be transmitted through 90°. It also reduces wear and stress on components. The large diameter of the crown also enables the watch to be easily wound, even while on the wrist. 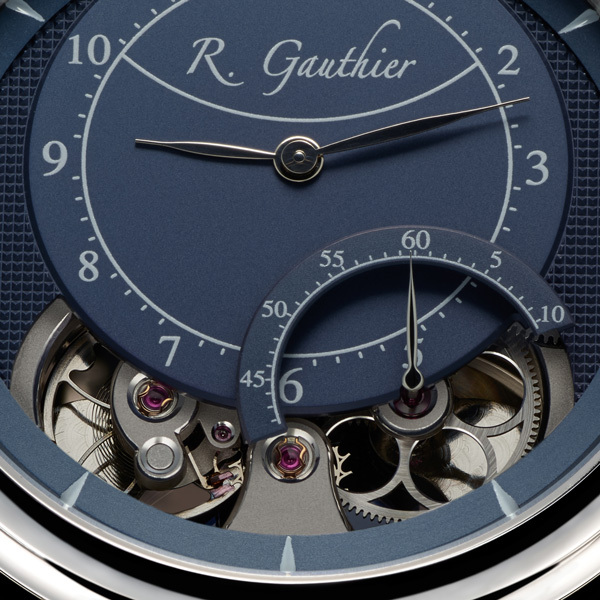 While the dial side treats the observer to a partial view of the movement – which was entirely conceived, developed, designed, produced, assembled and regulated by Manufacture Romain Gauthier – it is through the display back that this in-house calibre is fully showcased, with virtually every component bearing Roman Gauthier's distinctive touch. The Vallée de Joux style finger bridges catch both the light and the eye with their seductive polished curves. The bespoke gear wheels feature circular arms providing both elegance and strength; the polished screw heads bear a unique S-slot, enabling more torque to be applied and aesthetic. 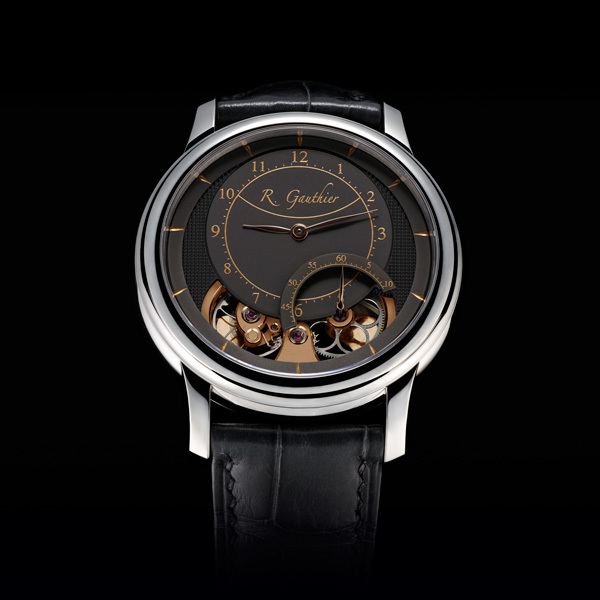 With its distinctive curved arms and calibrated eccentric weights, the balance wheel has been designed and manufactured by Romain Gauthier. 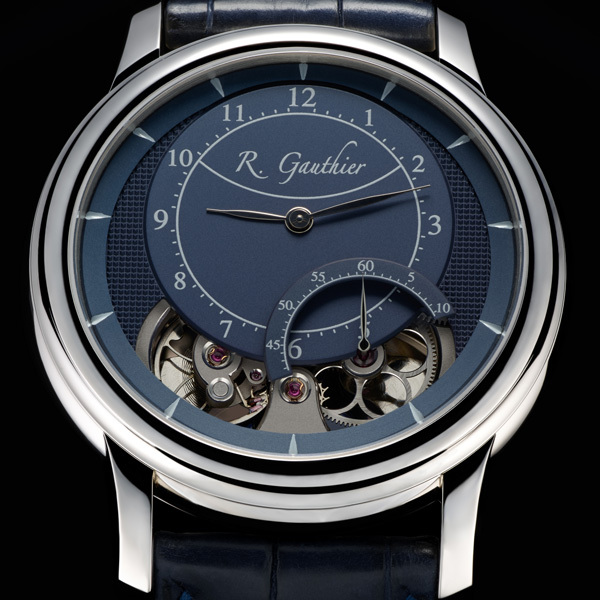 The regulator even features a high-efficiency triangular pallet lever, another Romain Gauthier invention. Impressively, all components are designed, developed and manufacture by Romain Gauthier except for the mainspring, balance spring and jewels. HMS Ten is available in three limited editions of 10 pieces each: platinum case/blue dial, white gold case/champagne dial and red gold case/anthracite dial.